Below is a blog written for TCV. Since moving from London to Glasgow I’ve followed the London National Park City campaign keenly and been really interested to see if there might be interest in the idea in Glasgow – so I was really pleased to help organise some events to start to find out what people think about the idea. On 19th September, working with partners at The John Muir Trust and Glasgow and Clyde Valley Green Network Trust, TCV was delighted to host two events which encouraged attendees to Imagine a Greener Glasgow. In the afternoon twenty partner organisations ranging from Greenspace Scotland and RSPB through to local community group Friends of the River Kelvin came together to discuss the scope for a shared, inspirational vision for the wonderful Green places of Glasgow. This was followed by a public event at the Glasgow Science Centre later that evening. The afternoon event was facilitated by Dom Hall from TCV and we were lucky to have SNH’s new chairman Dr Mike Cantlay attending the event and providing opening and closing comments. Speakers celebrated some of the great work already happening in Scotland with rapid speed presentations from 7 Lochs Wetland Park, Glasgow City Council, SNH’s Green Infrastructure Team and Cumbernauld Living Landscape. The main speaker at both events was Dan Raven-Ellison who for the last four years has been leading a campaign to make London a National Park City. Dan spoke inspiringly of how – just like our traditional National Parks – cities can also be great for wildlife, and great for outdoor recreation – so why not treat and view them in a similar way. London is 47% physically green, it has 13000 species of wildlife, 1000+Km of signed footpaths and 142 Local Nature Reserves – there is no doubt that similarly impressive (and surprising) figures would apply to Glasgow. Of course National Park Cities would be something different to our traditional National Parks. They would not have the same role in planning and they would deal with a very different kind of environment. Yet they could be an exciting and inspiring way to bring together much of the great work being done for our urban green spaces, and to address some of the gaps – to change the way we view, value and think about cities, to create more opportunities for wildlife and recreation, to engage more young people and families with the nature on their doorsteps and take more pride in the wonderful green places in and around our urban lives. 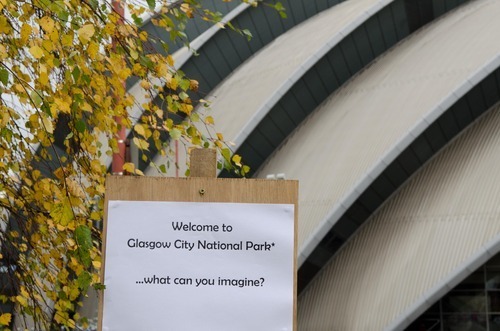 So, Dan challenged attendees – if People Make Glasgow – why couldn’t people make Glasgow a National Park City? It’s an exciting and challenging idea. What would it really mean if Glasgow became a National Park City? What are the unique green places, wildlife havens or recreational opportunities the people of Glasgow would like to celebrate? Do we need a new ‘Green Glasgow’ campaign when there is already so much good work going on? What might be some of the downsides? Would it detract from or complement other projects happening already in Glasgow? So let us know what you think. If you are interested to find out more follow @GlasgowNP , #WildGlasgow and #NationalParkCity on twitter and keep your eye on TCV’s social media as we plan more events soon to find out what people think of the idea. The moment Boris bobbled his head, stared straight down the camera and declared that June 23rd could be “Our Independence Day” I smirked, at an oversimplified, tub thumping catch phrase that surely everyone would see through. But my smirk did not last. It was replaced by amazement, then shock, then anger and then fear. People weren’t smirking, they were standing. They were cheering and clapping and I was realising. From then onwards and crushingly on 24th June amazement, shock, anger and fear have coursed through me in a way no political event has ever come close to causing. Politics has never made me cry, but on the 24th I sobbed repeatedly and uncontrollably. I lay all this on the table, for fear that what I am writing now will seem shallow, seem patronising, or just plain annoying. I recognise very much the need for people to feel amazed, shocked, angered and a million other emotions. I understand the desire to blame others for the decision we have made. I understand the clamour to re-run the referendum, or to laugh at the people madly googling “What is the EU” to see what we had voted to leave. But despite all these reactions we have to accept that a decision has been made. The British people have voted to leave the European Union and in my opinion, that is what we must now do. Yet nothing is decided. All the reasons I wanted to stay in the EU are still up for grabs. I wanted a progressive, peaceful outward looking Britain. I wanted better environmental protections, I wanted an economically and politically stable Britain which we could all be proud of and those things are all now up for grabs, in fact they up for grabs in a way in which they have never been in my lifetime and we have to seize that opportunity. The decision to leave the EU has been made, but that means little compared to how we chose the Britain we start to build now. So this is my five point post referendum manifesto. Markets don’t like disruption, they don’t like uncertainty. Most of us agree. We favour safe, known, understood normality to scary change. We tend to see disruption as a bad thing, but business opportunists and entrepreneurs tend to see disruption very differently. Talk of disruptive technology, instead of prompting fear and concern is seen as an opportunity, creating new possibilities. We have just experienced the biggest political disruption of a lifetime. Huge swathes of UK law needs to be reviewed and reassessed. The political status quo has been blown wide open. Our major political parties face leadership changes and policy review, and gaps are opening across the political spectrum. There are terrifying elements to this, but what fills those voids is up to us and with the uncertainty and nervousness, it creates huge opportunity. So we have to embrace the disruption, identify the opportunities it creates and work energetically to maximise them. To pick out just one example, decisions about our countryside have for many years been largely dominated by payments to farmers through the Common Agricultural Policy and environmental laws from EU directives – there is a big reassessment coming. Whilst many environmental organisations rightly fear a bonfire of environmental legislation, we have to unite and fight, harder than ever to realise the massive potential and perhaps a once in a lifetime opportunity to review payments to farmers and the interaction between those and our environmental laws to create wide reaching environmental benefits. Following the entrepreneurial theme – there is lots of established research and theory to back the idea that entrepreneurs don’t fail. What this really probably means is that successful entrepreneurs don’t see the failures they undoubtedly do have, as failures. They see everything they try, every disastrous new product or bankruptcy as an opportunity to learn. I think this is how we have to try to see this referendum. For some, of course, the referendum is a glorious success, but for those who campaigned strongly to remain it is a crushing, heartbreaking failure. But we have to try to now reflect on what we can learn from what has happened. It is maybe too soon to clearly reflect on what those lessons are. But for me, I have certainly learnt that living in an echo chamber of similar thinking, consenting voices is dangerous and no way to win a referendum – our major political parties will perhaps reflect on the same. We have all also had clearly revealed and declared to us that a large proportion of our population are not actually disengaged from the political process – but they are disengaged with our major political parties. Given the opportunity to tell us all what they thought, the British public came out in huge numbers to vote. There is of course an irony that whilst many of us liberal lefties have been bemoaning the apathy and disengagement of the general population for years – now they finally come out and vote – many of us don’t like what they have voted for. So if nothing else we have learnt that the population can be engaged and encouraged to come out and vote – but that the ability of the traditional mainstream politicians and experts across other fields to influence the opinion of this newly engaged electorate was found sorely lacking – working out how to achieve this is certainly a lesson we all need to learn and fast. Amidst all this change and disruption it feels reassuring to fall back on something reassuring clichéd – think global and act local. This simple idea to focus on simple, accessible, every day acts which we can do, which together can change the world on a larger scale, seems apt for this period. The inability of large scale politics and advice from experts to influence people’s vote is stark evidence of a simple reality – people’s votes, and indeed their thoughts and opinions are largely influenced by their day to day experiences. A large proportion of this population have told us clearly that their day to day experience of life has told them that they do not trust the ‘political elite’. They feel remote and isolated from a whole field of ‘experts’ and they feel strongly that their lives are on the wrong end of large divisions of power, influence and wealth. We also have to face an uncomfortable fact that many (and I am not suggesting all) of these people see the influx of migrants into this country to be responsible for many of the issues they experience in that day to day life. On a micro scale each of us can seek out opportunities to reduce those inequalities, to build cross-cultural communities, to show people in real, simple practical terms, an inspiring vision of a multicultural, outward looking, progressive society – where the poverty, inequality and divisions we see in the UK are diminished rather than enhanced at this critical time. We need to build in many tiny steps the world we want to live in. At the age of 39 it may be a little late, but I think this referendum has made me grow up. My daughter is just 6 months old – and she is quickly learning that things work out – that after a bit of crying and a bit of guesswork, Mummy and Daddy will fix the problem and things will be well again. I think I have only just grown out of this. It stopped being Mummy and Daddy years ago who I thought were able to fix every problem. But living surrounded largely by like minded, forward thinking, progressive people, I have maintained a film of Teflon allowing me to think that terrible things will not happen and, despite of course many ups and downs, the human race will essentially continue to progress, life will improve and we will find a way to work out the many challenges we face. Though climate change and environmental degredation are huge challenges, we will work it out. Though Donald Trump’s rise to power is concerning, the American people will not really vote him in. Surely, the world has created the systems, the structures and frankly the basic common sense to avoid ever again plunging into large scale international conflict – in the end, overall, we will find a way. But this referendum has shaken, in a terrifying but important way, the cosy reassurance of that way of thinking. I am not for a minute suggesting that now we have voted out of Europe environmental catastrophe and world wars will inevitably to follow – but I am suggesting that if your vision, like mine is for progressive, socially and environmentally responsible country then we can’t just assume those things will follow – we need to work positively and energetically to achieve these things. If anything good can come of this situation it’s that an awful lot of people have wept and raged about what we have lost and realised quite how much these things matter to them – we have to use that energy, it is needed now more than ever. Two days before the Referendum, my wife – in one of those hollow, but sometime powerful Facebook memes pledged to make our daughter as proud of her, as Jo Cox’s children will be when they grow up to hear of how she spent her life. It seems a suitable call for arms. Britain now stands at a time of massive change, uncertainty and in many quarters fear for what the future holds. But it is also a time of political engagement and opportunities. Ultimately our children will judge us not on the decision to leave the EU, but on the society we build and that starts today. Johnny lived in a beautiful house, with his loving parents. Sunlight trickled through the net curtains and bathed the living room in a warm, golden light. It was the day before his 8th birthday. Like many small children, Johnny had that innate ability to absorb information. In particular he drained down football facts and figures like a desert marathon runner at a water station. He knew all the players, their strengths and weakness, every result from the last three seasons. He watched hours of football, recording his favourite matches and watching them over and over – Johnny loved football. So when the big day, his 8th birthday arrived, he could not have been happier with the beautiful new, full sized leather football, and sparkling new season top, with his name and the number 8 emblazoned on the back. He loved that football and ran excited out into the garden to play. As the evening drew on Johnny was tired and settled to a final treat – nuzzled on the couch with his Dad, tea on his lap whilst he watched this week’s Match of the Day recorded the night before. As he did though, he couldn’t help being a little distracted. Johnny’s house was on the edge of large park. It was a ramshackle, city centre park. Teenagers slumped, oversized and bored on swings designed for much younger children. Dog walkers walked purposefully, enjoying passing through, but never wanting to linger. But most distracting for Johnny, children played football. Older, bigger kids argued fiercely, younger ones whooped with delight at a winning goal. Johnny’s parents weren’t keen for him to go to the park, but they knew the time was coming. Some of the kids started to get together and organise a mini-league. They saved up their pocket money and started to buy bibs, so they knew the teams, they even bought some goal posts and corner flags. Johnny always brought along his pride and joy, his beautiful, shiny, full size Premiership ball. Some of the other kids didn’t have much money and they couldn’t afford to contribute to the goals, or the bibs, but between them they had what they needed, and it didn’t seem to matter. It wasn’t all good, there were the older kids who sometimes pushed them off the pitch. Johnny often came home in tears, grazed, bruised, pocket money taken, but more often he came home excited about a new kid who’d come along, or a goal he’d scored. To Johnny it was his world, the rivalries, the friendships, the goals scored and the dreams lived out. Johnny was a really good little player – more often than not he ended up on the winning side, and as one of the boys who brought the ball and had extra pocket money to help buy other things they needed – the other boys normally listened to Johnny and he often got his own way. But Johnny’s football started to get scuffed and old. He was annoyed that some of the other boys never bought any of the kit. The boys started to change the rules, they’d do things Johnny didn’t like. Johnny was a bad loser and Johnny didn’t always win. One day he’d had enough, he took his ball and he went home. From now on he’d play in the garden on his own. He’d always win, and he could buy whatever he wanted and not have to share it with anyone. Of course he’d hear the others in the park. They’d managed to save together and buy a new ball. He’d hear them whoop and row, cheer and fight, but Johnny had his ball, and that’s what mattered. Think carefully on June 23rd – then vote REMAIN. Throughout the trip the lack of people was striking – villages were quiet, sites sparsely visited and it was rare to meet other tourists. In a country with a population of just 2million, this is perhaps not surprising but it of course has pros and cons. Generally the sites we visited were calm, quiet and restful. Even in the capital city the streets buzzed with nothing more than a gentle hum of locals and tourists mingling in the sunshine and sheltering under café parasols. The lack of weight of people meant sites generally felt unspoilt, peaceful and litter free. This lack of people, however, also brings problems. 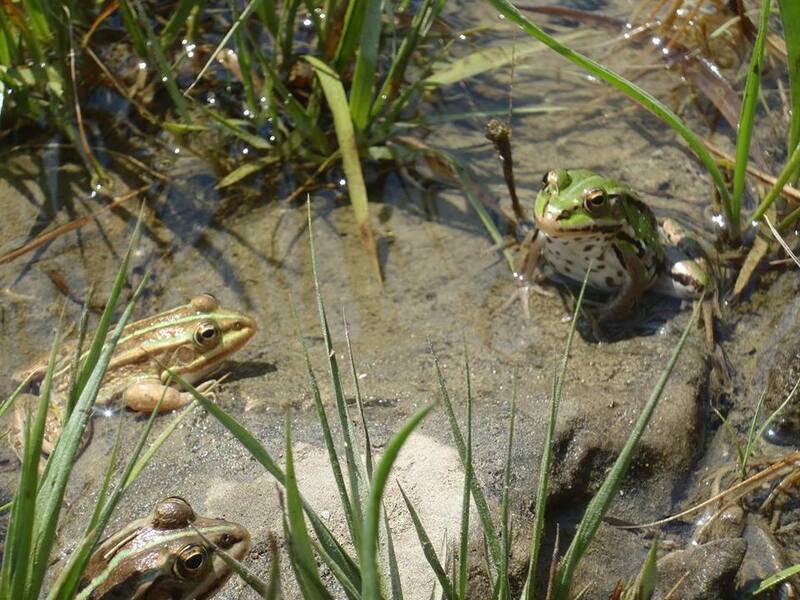 Eco-tourism enterprises promise much, in particular in the undeveloped southern part of Slovenia and in the newly branded, ‘Green Karst’ area where we spent much of our time. Yet empty sites is not a great sign for these burgeoning businesses and we regularly visited sites with annual visitor numbers in the low thousands. Whilst clearly EU and other grant funding has been considerable in supporting the development of ecotourism infrastructure it is hard to see the long term sustainability of these businesses, let alone their ability to generate the income required to protect wildlife and green spaces. So in the big picture people will be crucial. Convincing people of the merits of protecting natural heritage will depend on seeing real results, which in turn will rely on sufficient visitor numbers to generate income, without losing the quiet, natural beauty which is part of the area’s unique selling point. We visited the RDA offices and found them themselves under major development. We crammed into a tiny meeting room and as the director rolled his eyes and blew his hair out of his eyes repeatedly and a tiny fan fought against the searing heat, the whole set up seemed symbolic of the pressures pushing on him from all angles as he reeled off a list of projects he and the 10 other staff were managing; ranging from supporting new social enterprises, developing a new focus of technology and promoting the new tourist, ‘Green Karst’ brand. His story reflected again the wealth (though small scale) of funding coming into the area, yet the difficulties faced in really turning this into meaningful development and sustainable businesses. Listening to him talk I felt that I could be in a RDA in almost any rural area in the world as he discussed the need to deliver a wide range of projects on a tiny budget, the great opportunities they felt they had, set against the difficulties of marketing against global competition and the brain drain away from their traditional rural economies. “Do you see a tension between trying to develop the area, bring in more income and yet protect your environment?” one of the group asked. His emphatic “no” at first seemed a little disingenuous, but on reflection was perhaps more representative of the difficulties of achieving large scale changes in bringing development to under-resourced, under-populated rural areas. The Ecovlje Salt-pans were unassuming at first glance. Small numbers of tourists wandered through the traditional salt flats. Sign boards indicated further EU investment in supporting the traditional crafts of making salt on this small stretch of Slovenia’s limited coast line. Addressing us on the roof of the small visitor centre, dressed in shorts and a T-shirt Andrej himself appeared equally unassuming. However, as he talked it became clear that this small, unassuming area had a big conservation story to tell. How a director of the national mobile phone company, ‘fell in love’ with the area and agreed to invest not only money, but time and marketing skill, in developing a unique brand of artisan salt which could provide local employment and protect the salt flats, also important for wading birds and other wildlife. He told us how he too, had fallen in love, sufficiently so to give up an IUCN job which was three times better paid to work long hours late into the night developing business plans and even carry on having been beaten up and put in hospital by 3 local guys who had mistakenly believed he planned to build hotels on the salt-pans. It was a story both of community involvement failures like this, but ultimately one of success, with the business now employing 96 people and selling high end salt across the world. It was an inspiring story of how business skill and conservation drive can come together and create workable solutions. “The key to engaging the community was showing real results”, said Andrej tellingly. However it was also no fairy tale. With the need to build the salt business to stand on its own two feet, Andrej told us there was much uncertainty in what the future would hold, but it was clear that with his passion for wildlife, belief in supporting and involving the local community and economic and business acumen, that future was in good hands. Miriam is the only female forester in Southern Slovenia. Third generation, born and bred in the same village in which she now lives, she is passionate about the forest and her local area. Her passion to take people out into the forest and educate them, alongside protecting and working the forest in a sustainable way was truly inspirational. However, perhaps the most striking elements of what she said over the course of the day we spent with her were the similarities of her concerns, to those we have at home in the UK. She bemoaned the lack of connection and pride Slovenians have in their amazing forest and perhaps more surprisingly, spoke with real sadness as she described the beautiful lake by her house where she continues to swim every day – and her disappointment and disbelief that local families and children no longer swim in that lake – the children more interested in playing computer games, the parents scared that the children will drown. Hearing this reminded me how easy it is to assume that we have worse problems than other places and to idealise other’s experiences. Instead, even in this seemingly rural idyll, lack of connection to nature is a problem affecting people’s daily lives and the long term conservation of their biodiversity. But they need help and support, they are generally under resources and face major problems, philosophical, economic and practical. Nonetheless, with suitable support, full integration with the local community and economic and business astuteness, exciting solutions are available. These lessons apply in Slovenia as they do the world over and I will take back to Glasgow a vital reminder of these simple but important facts. Over the years I have generally failed to vote, sometimes through apathy, sometimes organisational failure, but mainly through a strong and unshiftable feeling that no political party in any way represented a future that I supported. Over the last few years I had become increasingly convinced that the Green Party had to be the one for me. I passionately believe that green issues are hugely important, and that they are largely ignored and sidelined in mainstream politics. So I decided I needed to vote Green; to send a clear message, along with the thousands of others flooding to the Green Party, that these issues are important, and must be taken seriously by political parties. But as I was coming to this conclusion I started to look in more detail at the Green Party and watch its output in the media, social media and it’s mini-manifesto. Once I did this I started to feel rather disappointed about the lack of green I found there. Strong rejection of nuclear fuels and GM crops could certainly be seen as green policies, though both I feel are mistaken and tend to make the green agenda seem more about a slightly hippy influenced Luddite attitude than the kind of progressive, inspirational green policies I would like to see promoted. Beyond these policies there feels too little green, in the Green Party. I can see that there is a strong argument that they need to show they have a rounded and complete policy agenda, that they can be a credible political party with things to say not only on the environment, but on foreign policy, education and the health service. But what I really want from the Green party is a passionate, innovative, forward thinking promotion of Green centred policy making – yet where is the focus on green space, on improving habitats, on increasing connectedness to nature? This is not to say that the Greens should pigeon hole themselves as being only about green issues – because these issues show precisely why focus on protecting our natural environment should be a core part of how a government makes decisions in all policy areas. Green space can bring healthier, happier citizens, more active and less in need of NHS treatment. Outdoor education can inspire a generation of children to understand and value the world around them whilst building skills across the educational curriculum. Better habitats can protect against flooding, reduce the costs of water treatment and engage people in a richer, more exciting natural world, bringing connectivity to a world of mental wellbeing and connected communities. So green policy making does not need to be a niche pigeon hole. It is a core philosophical stand point on which wide reaching policies can be built. As an example I would encourage the Green Party to follow the approach of (and build into their manifesto) the RSPB and Wildlife Trusts’ ‘Act for Nature‘. 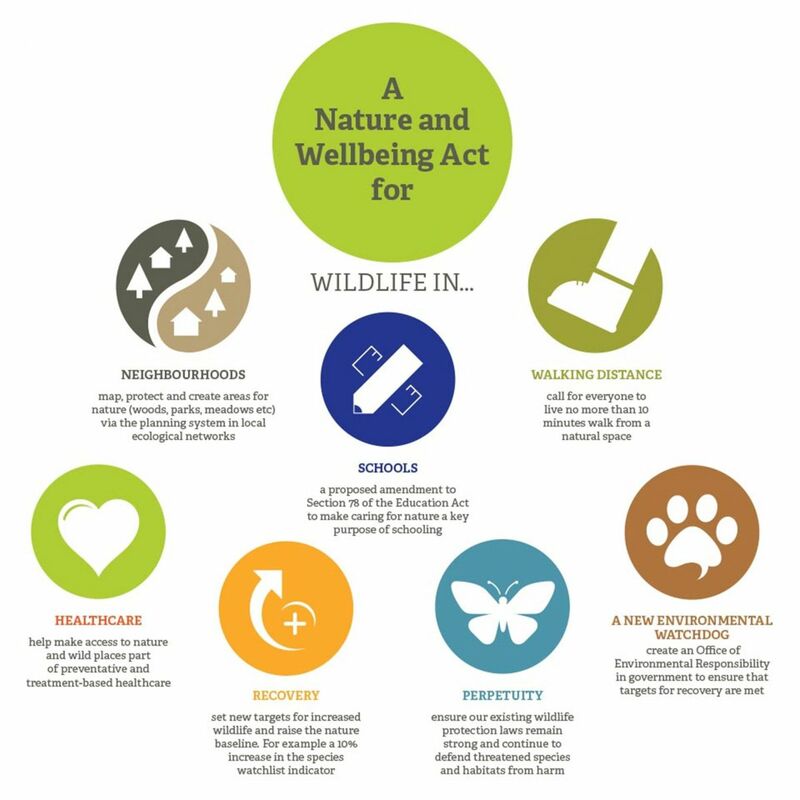 The Act aims to instill this approach to integrating wildlife and environmental policy into the heart of all government decision making and the campaign running to promote the act focuses on a wide range of implications from health and wellbeing to ecosystem service management. With the Green Party conference fast approaching I think and hope they have a massive opportunity. People are disillusioned with the traditional political parties and Green Party membership is soaring. The Green Party have a huge opportunity to bring environmentally focused decision making to the heart of government and bring new, innovative approaches to environmental issues. I hope that is the driving force behind the conference, and behind the manifesto. The impetus to show broader credibility and broad policy making should flow from this and not get in its way. In a week when I was inspired to see the passion and energy coming out of the Re-imagine London Event as part of the campaign to make London a National City park, an age old argument is re-emerging in another existing national park close to my heart, the Lakes. It once again shows the difficulties of planning in a National Park, and some of the issues which would have to be addressed when we come to the practicalities above and beyond the philosophy of a National City Park. The plans of United Utilities to erect a new 9.6km fence above Thirlmere in the Lake District has once again divided people. The underlying reason is a huge variety in people’s vision of what the National Park should be for and about. UU’s plans had once again re-vitalised the issue I looked at extensively during my Lake District project last year into perceptions of land use. All parties would argue they love the Lake District and want to protect it, but their vision of what this means is in reality very different. “We strongly object to this intrusion into this wild, unspoilt landscape of the Lake District National Park”. These are the words of the Open Spaces Society who are objecting to the plans on the grounds that it will be an eyesore and restrict free access for people to enjoy the fells. These are principles I agree with. I am passionate about the importance of access to the outdoors and as a walker and climber, access to the fells is something I feel strongly about. The Lakes are a stunning landscape and I would rather not see any man made impact on them at all. This, however, of course ignores the fact that the Lakes are already entirely man made. The landscape we see and many of us love is beautiful and inspiring, but is it really ‘wild’ or ‘unspoilt’? The landscape has been created by a range of human impacts, not least of which are the sheep which have a profound effect on the habitats of the Lakes. Sheep in themselves divide opinion; to some they are a force of ecological evil, dominating the vegetation of the Lakes, and depriving us of a richer, more dramatic and arguably, a ‘wilder’ Lake District – more wooded, more diverse in terms of vegetation and richer in wildlife. Others would argue that sheep are instead at the heart of the Lake’s cultural heritage. The pastoral history of the Lakes is at the core of the way the Lakes is; its poetry, its history and its people. This is a rich and unique cultural history which also preserves a traditional landscape which generations have loved and enjoyed. I agree with these arguments, both of them; I love the landscape of the Lakes, and the part that traditional hill farming plays in this. Hill farmers are at the core of personality of the Lakes, and the livelihoods of the people who live and work in the park have to be an important element in any future plans. At the same time I would love to see a more varied, wildlife rich habitat in the Lakes and, whilst I think it is changing, the history of intensive sheep farming has had a definite impact on the biological richness of the park. I am also a consumer of water, and I would like water companies to do what they can to treat our drinking water effectively and efficiently, keeping prices down whilst meeting the increasing rigours of EU water quality laws. This, United Utilities would argue, is the reason for the fencing; to keep sheep away from the edges of watercourses, reducing the erosion and, in turn, the upward trend in dissolved organic carbon (DOC) increasingly affecting our water quality. People are quick to dismiss this argument, labelling it profiteering by a big bad water company. However, whilst I fully accept that savings made by big corporations too often disappear into shareholders pockets, they are also essential to keep bills affordable. Furthermore, having spent some time with UU staff during my Lake District project I can honestly say that some of the strongest environmental advocacy for better habitats and wildlife, came from people at UU, passionately defending the opportunity created by a coincidence between action needed for clean water and richer habitats. So where does that leave us? I agree that we should avoid man made blots on the landscape of the Lakes, I agree that the sheep farming history and culture of the Lakes is a vital part of its personality, I agree that we need innovative and progressive new approaches to protect our water, perhaps our most valuable resource, and I agree that this approach needs to extend to a new focus on improving and extending our habitats and wildlife. So where does it leave us? It leaves us with difficult, case by case decisions, in which sometimes a fence is good, and sometimes bad, in which the simple sheep is a complex agent in a more complex land use debate, and we need to work together to try to achieve all of these aims. I fear that those who say otherwise, and make out the issue to be black and white, right or wrong have erected fences themselves, framing the question about the future of our land use so firmly through their own lens that they fail to see the valid arguments on the other side. What would a ‘National Park City’ be? This blog was written for and first appeared on the Glasgow City National Park website. To see the original and find out more about a National Park in Glasgow see the website. I am excited about the idea of National Park Cities, I am excited about anything which protects, increases and improves the green spaces we have. I believe we need to encourage more people to value our natural heritage and get more people out enjoying the great outdoors. The concept of a Glasgow City National Park is in early stages. The exciting thing about the movement is collecting people’s thoughts, ideas, and imaginings of what a ‘City National Park’ could be. But part of my brain just won’t let go of boring functional questions – what would a Glasgow City National Park actually mean, how would it be managed, would there be a national park authority in Glasgow and how would they decide the difficult planning issues which underlie the biggest challenges in many of our existing traditional national parks? I’m not suggesting I have the answers to these questions. But for those of you – who like me – get bothered by practicalities, here are some thoughts. Where have National Parks come from? Scottish-born John Muir spearheaded the effort to create Yosemite National Park in the US. This developed the traditional notion of national parks as areas of ‘wilderness’. Creating these wilderness areas often involved moving people out, stopping development and protecting the wildness of a place. This clearly couldn’t apply to Glasgow – it is not a wilderness and no one is proposing kicking people out of it. However UK National Parks are not wildernesses either. They are living, working ‘cultural landscapes’ which exist balancing (sometimes difficultly) the support of wildlife, protection of landscapes, visitor management and creating sustainable livelihoods for local people. In Scotland the majority of the land in National Parks is in private ownership and has been worked by humans for thousands of years where forestry and grazing, mining and even building have resulted in landscapes which are semi-natural. Like their English and Welsh counterparts, the parks in Scotland are effectively “managed landscapes”, and are classified as IUCN Category V Protected Landscapes because of this. What is a Scottish National Park? These seem pretty good principles – why should they only apply to national parks? On this basis perhaps the whole of the UK should be a National Park – surely we should always consider these principles, in any area? As with most things, the devil is in the detail as balancing the, often very different needs, of different stakeholders within a park can highlight difficult compromises and trade-offs between these four aims. Difficult decisions can be found as examples in long running debates such as developing a zip-wire in the Lake District, and mining for gold north of Loch Lomond. In the case of national parks, guidance is available to help decide these kinds of difficult land-use conflicts, but much of the decision comes down to an individual national park authority. The general purpose of the national park authority, as defined in the National Parks (Scotland) Act 2000, is to ensure that these aims are “collectively achieved …in a coordinated way”. Although the four aims have equal status, in accordance with the Sandford Principle, the first aim (conservation and enhancement of the natural and cultural heritage) is to be given greater weight when it appears to the park authority that there is irreconcilable conflict with the other aims. So what would all this mean for a Glasgow City National Park? What is being talked about at the moment in both Glasgow and London (Greater London National Park) – potentially steers clear of the introduction of new authorities with planning regulations. So what does that leave us with – a National Park lacking authority is perhaps very much just ‘notional’? A ‘paper park’ that is powerless to decide how things develop or how to balance competing needs of sustainable development and nature protection? But on the other hand maybe what we are looking for is not a national park authority for Glasgow, but a ‘National Park Philosophy’ – an increased recognition, discussion and imagining that cities can focus themselves on the protection of nature, wildlife, landscape and recreational space. An framework for cities to become great places to get outdoors, to find adventure and to experience wildlife and nature. In the UK, the Lake District National Park calls itself the Adventure Capital, Fort William the Outdoor Capital. These are not statutory, authority driven rules, but they are statements of intent – that planners, companies, residents and other interested parties can work towards to help make that place unique and important. There is no law or authority to decide if they have got it right – the people decide – they vote with their feet. If the Lake District manages to successfully promote itself as the Adventure Capital, and people come, and find adventures and great facilities then the project is working, and people will return. Maybe in the same way if we can talk together about what we want a Glasgow City National Park to be. It is up to us to continue to discuss and implement that philosophy and encourage others to do the same. If this helps make Glasgow a better place to live and visit, if it enhances the value placed on quality green space, and ensures a shared re-imagined vision for Glasgow developed under a National Park City banner – then the project will be a success. This is why I’m supporting the campaign to make a Glasgow City National Park. Not all change comes about through authorities, guidelines and law, so perhaps the philosophy of a Glasgow City National Park is more important than the boring, functional details of how it might work. What do you think? Contact Glasgow City National Park via email (glasgowcitynp@gmail.com) or on Twitter (@GlasgowNP), or leave a comment on theFacebook page.